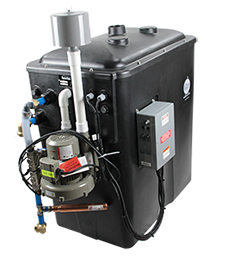 The AIRaider 433 models successfully and dependably remove radon and VOCs from well water through a patented multi-stage aeration method that provides up to 99%+ radon reduction. For nearly 20 years they have provided the standard by which other radon in water aeration equipment is measured. Up to 99+ Percent Radon Removal - Customer-confirmed; independently tested. Smaller Footprint - Unobtrusive, compact design. Easy Maintenance - Fully accessible, for easy cleaning from the top. Quieter Operation - The built-in pump reduces audible level of pump noise. No Sweating - The double-wall foam-insulated tank will not sweat. Tight-Seal Lid - Molded-in brass t-nuts and stainless steel machine screws provide a tight, mechanically positive seal.